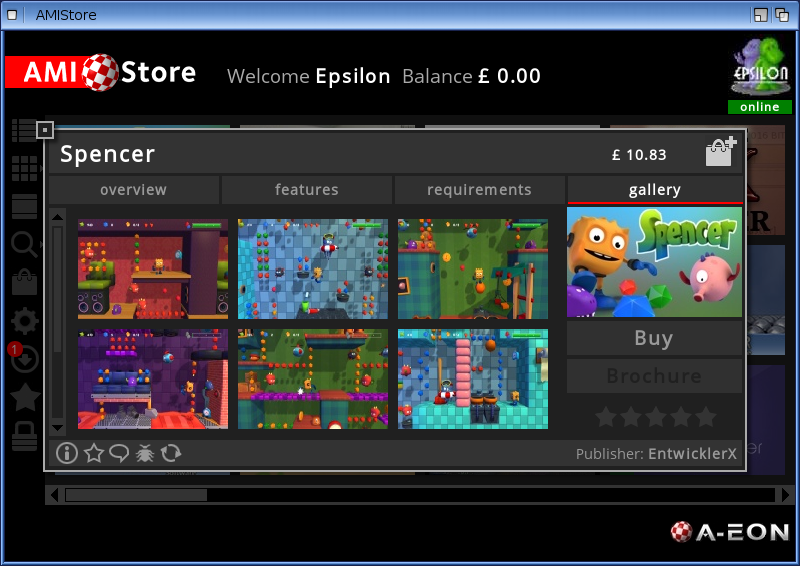 Today I am looking at the newly released game Spencer by Entwickler-X for AmigaOS 4.1 Final Edition on my AmigaOne X1000! Just the other week we saw the release of Tower-57 on AmigaOS4 and now this week we have another brand new Amiga game! How awesome! 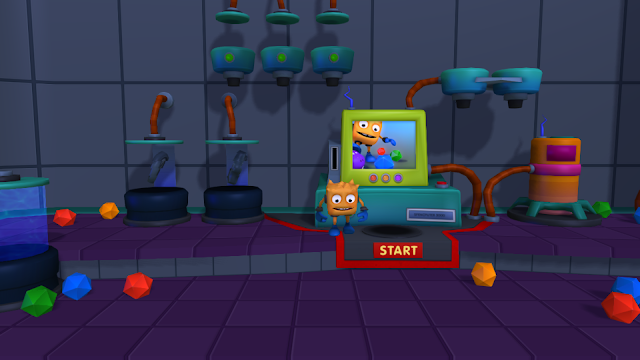 Even more exciting is that this is the first commercial game for AmigaOS 4.1 Final Edition that uses and requires the new actively developed Warp3D Southern Island chipset library (with compatible Radeon card), Warp3D Nova library (together with the Radeon HD drivers) released by A-EON Technology. It is great to see software using the features of this new extended AmigaOS 4.1 functionality. I look forward to many more to come! 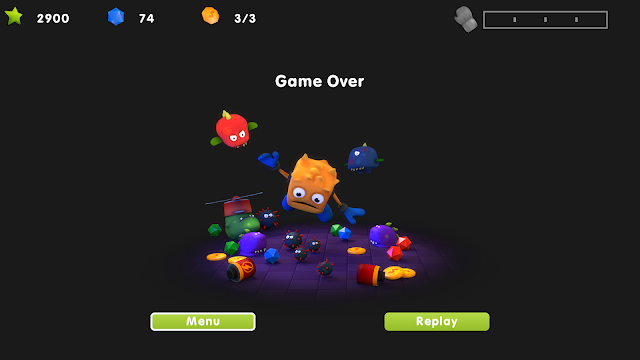 The game is available for purchase on AMIStore, Alinea Computers or on Entwickler-X's website here. There is also a demo available on Entwickler-X's website to try out first! 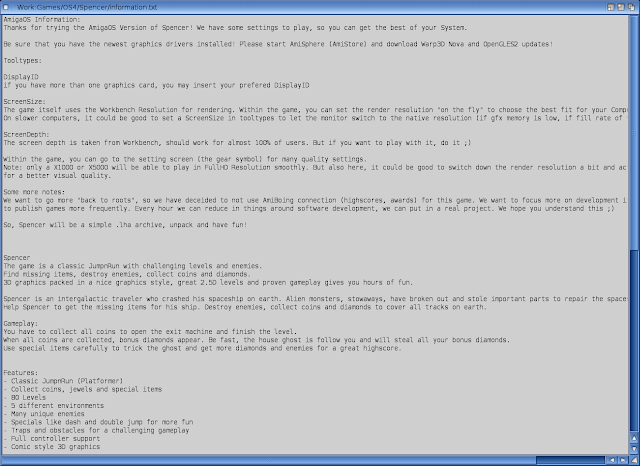 The required Radeon HD drivers and Warp3D Nova library are available for purchase on AMIStore, or as a bundled Enhancer Plus offering on AMIStore or on AmigaKit's website as a physical product. 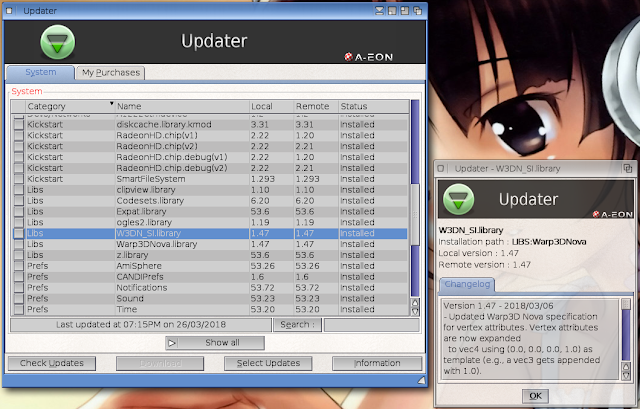 Important thing to note is that the Radeon HD and Warp3D Nova drivers are required to be installed, and updated to the latest version recently released. The easiest way to update the software is to use the Updater software, which is included with the Enhancer Plus software. If you don't have this, then updated via AMIStore. You need to login using the AMIStore (AMISphere) login to use the Updater tool. Updater allows granular updating of system components and applications rather than having to download the full software from AMIStore every time a small section is updated. You can quickly see the local X1000 version and the latest version available, and status if upgrade is needed or not. You can see the view changes in the version by clicking on Information when a particular component is highlighted. You can also review your AMIStore purchases within Updater to see if there are updates available for them also. 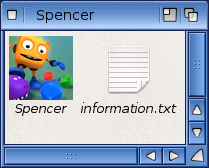 You can navigate Spencer with the keyboard to move to the settings and information sections and Space to select. 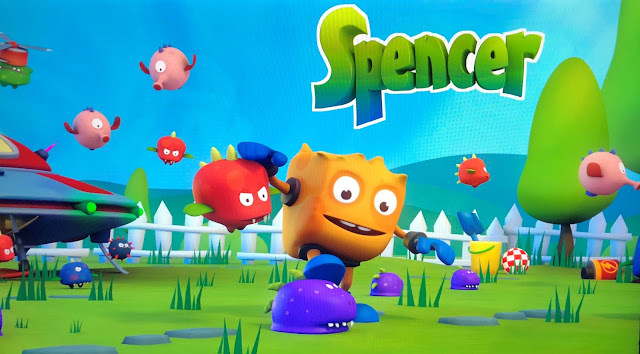 Spencer is a classic platform game (jump and run), something the Amiga has always been good at, with so many classic games in the genre on Classic Amiga. 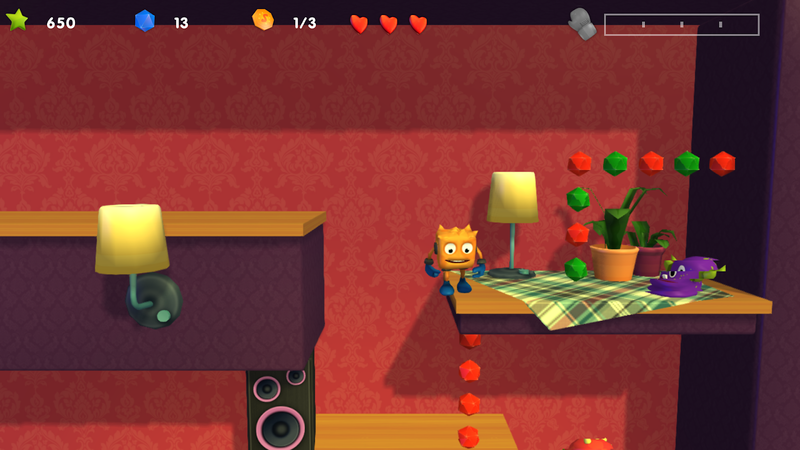 On NG Amiga, Spencer brings platformers on the Amiga into the modern age with beautiful 3D graphics that look beautiful and much nicer than any I have ever seen on Amiga before. 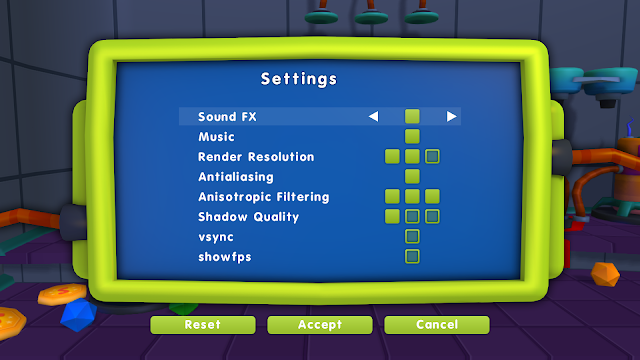 In the settings area of the main menu you can adjust the Music, Sound FX, render resolution, whether anti-aliasing is turned on, and other settings too as below. 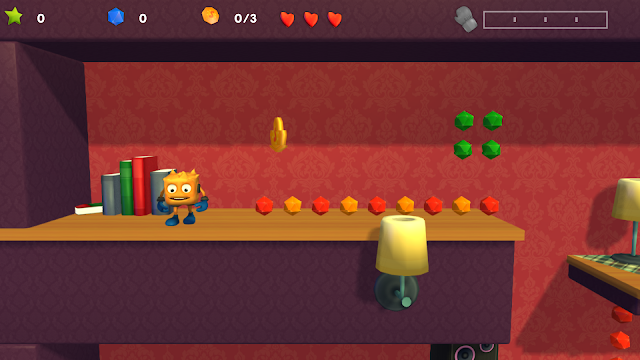 On my X1000 anti-aliasing works great and look terrific! I have heard it runs even faster on the X5000 but from my playing of it, it works perfect on my X1000. 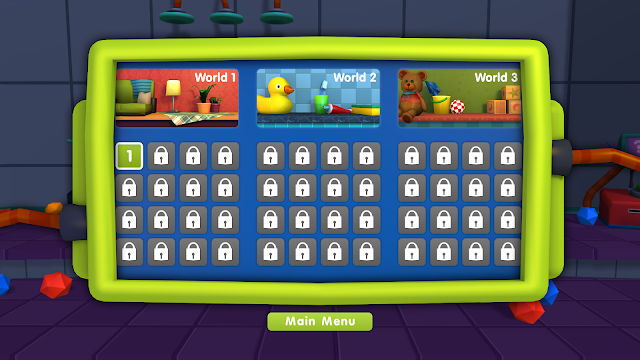 As the game starts, you can see the first 3 worlds, with only the first level of World 1 unlocked to start with. 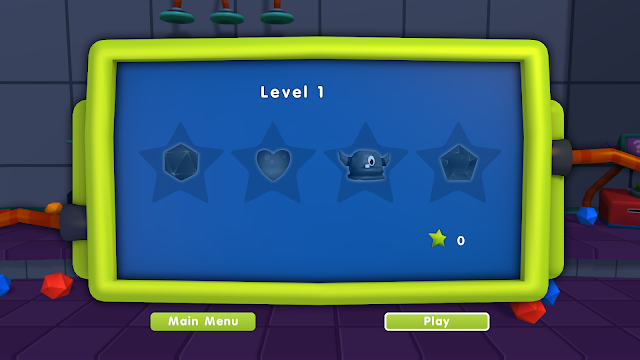 Additional levels are unlocked as you progress through the levels. 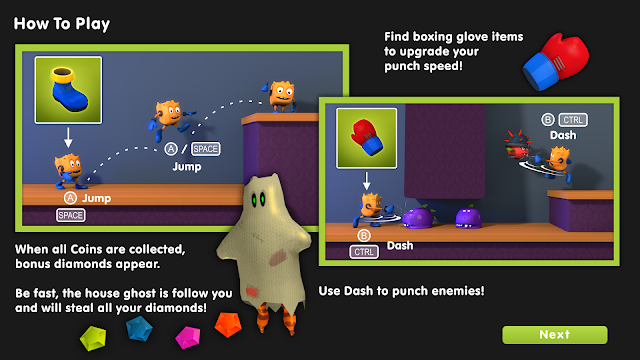 Of course if you are not good at avoiding enemies or ghosts then you quickly end up dead, as I did! Like Angry birds, there is no limit to the number of retries, so you can keep retrying until you nail each level. This is great as the traditional "lives" model is rarely used in modern games these days. 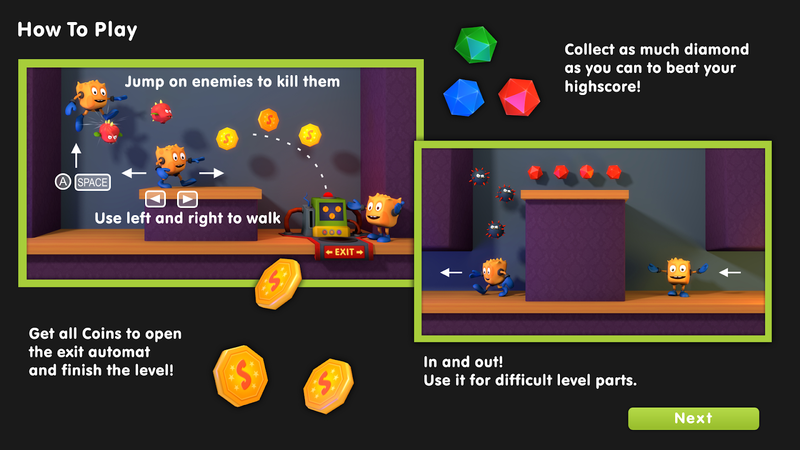 Here is some more shots from later levels with an iPhone as screengrabs were difficult with moving objects on the screen getting messed up (sorry for the grainy shots). I do recommend turning the music off though, as it does get a little repetitive after a few levels. Fortunately you can do this in the Settings section on the Main menu. 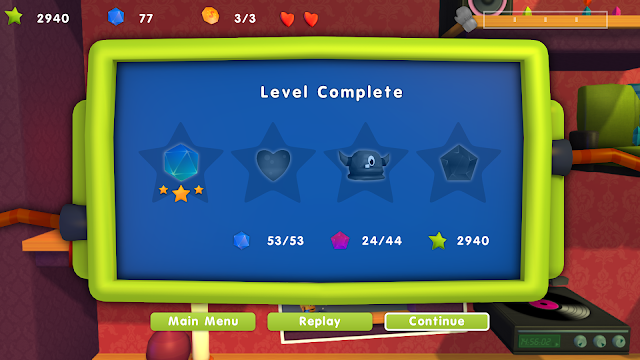 I played thorough the first 5 levels and I definitely want to do more! There are many more levels and worlds to explore in this game! Spencer is a great game for AmigaOS 4.1 Final Edition in 2018, with great graphics that use the new Warp3D Nova functionality well. Recommended!